Table for two, please! At the hizz-ouse. Don’t be discouraged because it uses three pans. Great meals sometimes require a mess. After boiling this in chicken broth and water, I drained it and blended it with salt and cracked red pepper. Add a dash of chicken broth and use a spoon to stir around if needed. 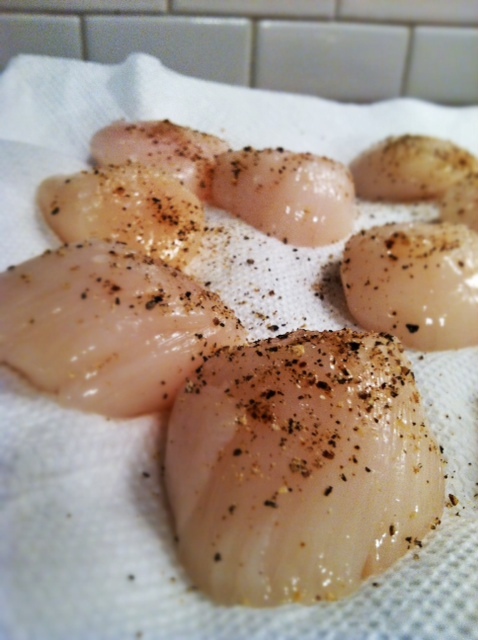 The trick to getting your scallops to caramelize is washing the scallops and patting them dry really well. The other trick is hot butter. For me 1.5 minutes on each side is the perfect time and doesn’t over cook. 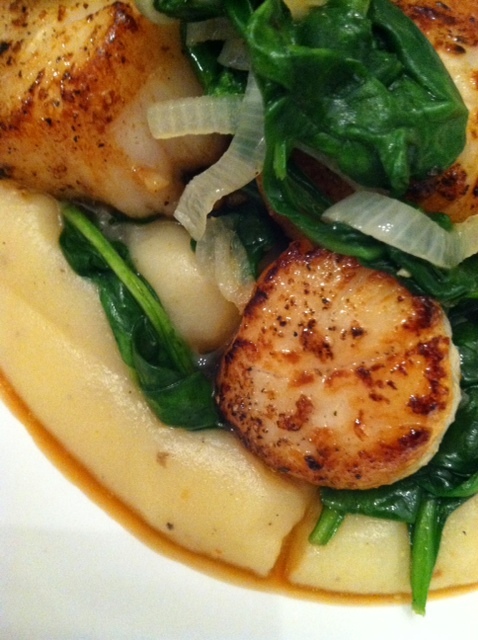 Sauteed spinach adds a burst of color and the shallots deepen the flavor. Fancy date night meal, ready in under 30 minutes so you have lots of time for other important date night activities. In a small pot, bring 3 cups of chicken broth and 2 cups of water, to a boil. Add cauliflower and potato and cook until fork tender, about 15 minutes. Meanwhile, heat one tablespoon of olive oil in a non stick skillet, over medium low heat. Saute shallot, until soft, 2-3 minutes. Add spinach and saute slowly so that it wilts. 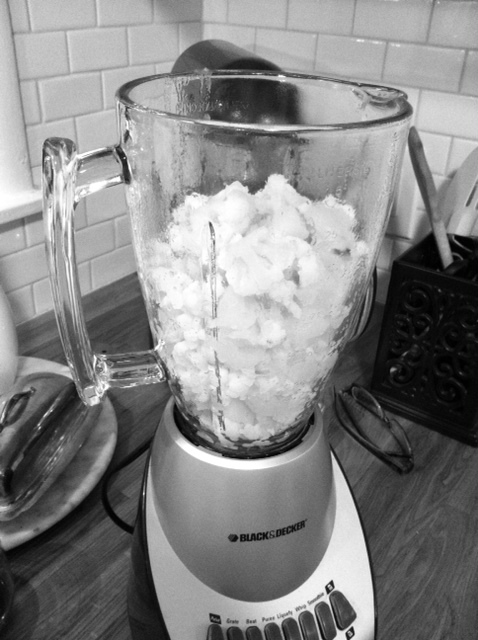 When the cauliflower and potatoes are done, drain and pour veggies in a blender. Add 1/2 teaspoon salt, 15 twists of black pepper and the 1/4 teaspoon of red pepper flakes. Blend on high and add a splash of chicken broth if needed. You may have to stir them a little but they should blend and be velvety. Set aside in blender. Now, heat 3 tablespoons of butter in a large non stick skillet over high heat unitl the butter is hot and melted, but not brown. 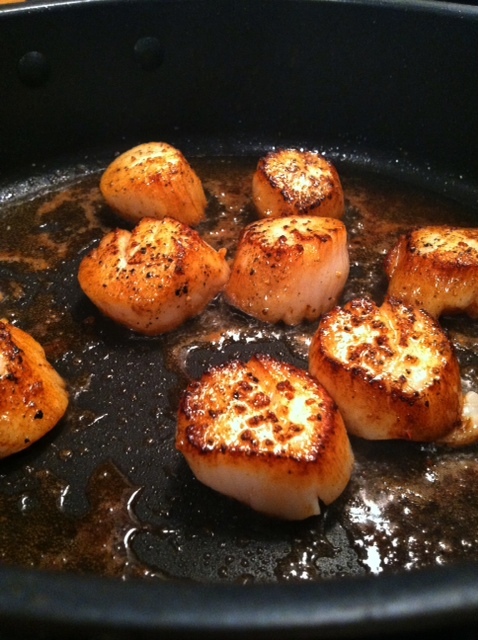 Sprinkle scallops with salt and pepper. 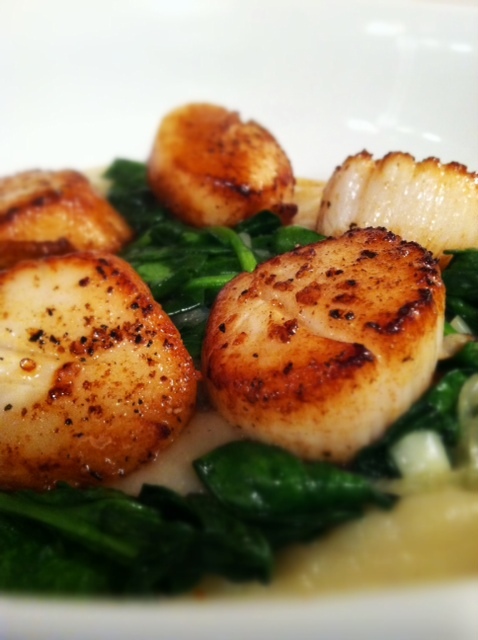 Add scallops to hot butter in pan for 1 and 1/2 minutes. Flip and cook for 1 1/2 minutes more. 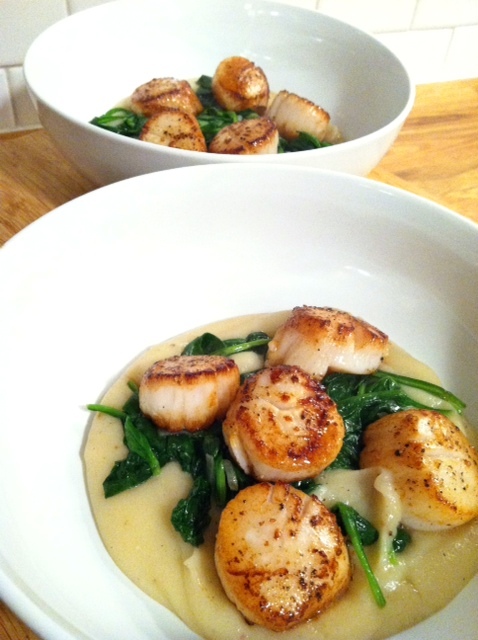 Ladle cauliflower puree in a large bowl, top with wilted spinach and scallops.